People are increasingly using laptops to watch movies and listen to music. Laptops are very portable making them the ideal choice for many. However, laptop speakers are very small and never do justice to what you are listening. The built-in laptop speakers are not the best when it comes to full blast music. Having laptop speakers will significantly improve the audio of whatever you are watching. However, if you have ever visited an electronic shop you probably found it difficult to select the right speaker. There are rows of computers speakers with different specs making it difficult for buyers to make the right decision. To help you out, we have come up with a buying guide and selected some few laptop speakers that stand out from the rest. 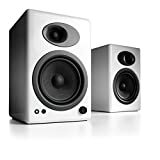 Never rely on the manufacturer specs as no standard method exists for testing speaker’s frequency. Instead, your ears and listen to the quality of their sounds. The store might not be the best place to test the speakers, but it is best to test them out. Don’t be wowed by the bass or treble, instead, listen to the quality produced by the speakers. Are you planning to use the speakers with just your laptop only? Well, speakers with multiple inputs are highly recommended. These allow users to play music not only from their laptops but also smartphones and tablets. You can also choose to go with wireless speakers that work well with multiple audio devices. Most laptop speakers lack their controls and are instead controlled by the laptop or computer. Avoid this and look for speakers that have their sound controls. These offer you flexibility in sound control as you do not have to depend on your computer for control most of the time. Speakers with better sound quality and great features cost more. However, you may have to shop around to get the best deals. Speakers are among the most discounted items in the market. Don’t just buy in the first shop, shop around and you will get better deals. Here some of the best laptop speaker you can find in the market currently. We have selected just three with the best features and high sound quality. They also offer real value for money spent. Audioengine A5+ 2.1 value multimedia speaker comes with a built-in amplifier. The amplifier takes listening to music to a completely new level. This is one of the best laptop speakers you can find in the market compatible with all computers; Mac and PC. It can be controlled with a remote and comes with several input units. It has a USB power, RCA inputs with all the necessary cables included. The thermals are well managed. It does not heat too much and has silk tweeter that make the sound much better. 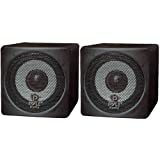 The speaker is well covered by Audioengine three year warranties. This is very simple budget bass laptop speaker with very good features. 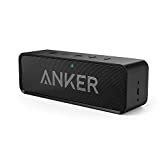 We all know Anker likes keeping things simple but this one is a step ahead of all their previous models. This is their first Bluetooth speakers with long signal ranges and a powerful battery. It is very small and can easily be carried around with ease. The high-performance drivers in this speaker will produce high-quality sounds with full-bodied stereo. The Soundcore usually reconnects to the last device used automatically. These are very cute and look sharp on bookshelves and tables. They are ideal for listening to music and watching movies on your laptop with their high-quality sounds. The three-inch paper cone drivers in these speakers are powered by just 100 watts making them ideal when for small power packages. The power shielding in the speakers prevents damage to the CRT monitors. If in the market for the perfect laptop speaker, be sure to order one from the three above. You stand to get a better quality speaker offering value for money. Enjoy your music and watch movies using the speakers above.